I knew something like that was coming with such a forward Subject line. Can't fool me Tor Tor. "Cuz we're TMT, we're dynamite!" You are tricky...I was expecting an announcement of another kind :) I don't share your same love of coconut, but I will take your word on it! 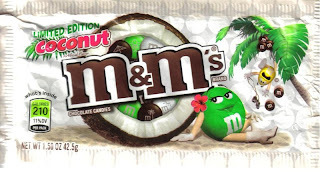 mmm, I need to try these delightful m&ms! When will you be in love with a cute boy though?